"It wasn't the poverty or the helplessness that disturbed him; it was the thing he would see again and again during the days to come- in the empty windows of photography shops, in the frozen windows of the crowded teahouses where the city's unemployed passed the time playing cards, and in the city's empty snow-covered squares. These sights spoke of a strange and powerful loneliness. It was as if he were in a place that the whole world had forgotten, as if it were snowing at the end of the world." When someone asks me if I like the movie Goodfellas, I never know what to say. It's a well-directed, well-acted, well-told story, so I think it's a laudatory work of film and I admire its accomplishments. But I didn't actually enjoy watching it and I have no desire to do so again. It's one of those weird things that happens sometimes for media in all forms, for me. I'll find something to be a significant piece and worthy of praise, but that doesn't mean I always actually like it. 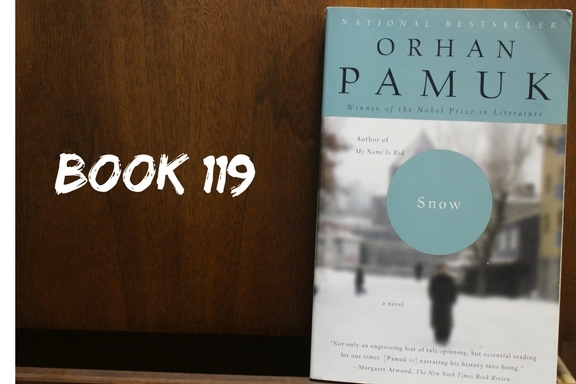 Orhan Pamuk's Snow falls into that weird, middle-ground territory for me. It's a well-crafted tale, rich with context and layers of meaning. But I didn't actually enjoy reading it all that much. From a third-person narrator point of view (we'll get to that later), Snow tells the story of Ka, a Turkish poet who has spent much of his adult life in political exile in Germany, newly returned to his home country for his mother's funeral. When he hears from an acquaintance that a beautiful former college classmate, Ipek, is freshly divorced, living in a border town called Kars, he finds himself a pretext to visit there to see her. The pretext is that there's been a recent wave of suicides among devout Muslim young women, who have been forbidden by government policy to wear their headscarves, and he's there to investigate. But the writing and structure is lovely. It's a little snowglobe of a story, and effectively creates the air of emotional claustrophobia that anyone who's been stranded (by snow or flooding or ice) for a few days can understand. I'm not sure that the third-party narrator is as effective a device as it could be, but I got a wry, frustrated smile out of plot machinations that mean that we never actually get to read one of Ka's inspired poems...it lets us just imagine how great the poems must have been without putting Pamuk under pressure to write something magnificent. This was a book club selection, and proved divisive for the most part: there were several people who loved it and just as many who completely hated it, with only very few (like me) falling in between. I wouldn't necessarily recommend it based on my own experience of it, but maybe you'll completely love it like some of my book club friends? Tell me, blog friends...do you read literature in translation often?